The District responds from three volunteer fire stations located in Corbett, Springdale and Aims. Fire District 14 has been providing fire, rescue and emergency services since 1949. This service area includes parts of the Columbia Gorge National Scenic Area, numerous Oregon State Parks and Recreation Areas, US Forest Service lands, Interstate 84 and the unincorporated communities of Corbett, Springdale, Aims, Latourell, Bridal Veil and Coopey Falls. A Public meeting of the Budget Committee of Corbett Fire District No. 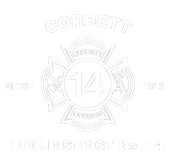 14, Multnomah County, State of Oregon, to discuss the budget for the fiscal year July 1, 2019 to June 30, 2020, will be held at the Corbett Fire Hall, 36930 E. Historic Columbia River Highway, Corbett, OR. The meeting will take place on April 10, 2019 at 7:00 p.m.
A copy of the budget document may be inspected or obtained on or after April 8, 2019 at the Corbett Fire Hall, Mondays between the hours of 5:00 p.m. and 8:00 p.m.